Phu Quoc island in Vietnam offers chances to relax on the beach, explore fragrant countryside, marvel at wildlife – and enjoy sumptuous seafood. Just get there before mass tourism, says Sam Llewellyn. The plane crawls high above the Mekong delta – flooded paddy, intestinal loops of river, roads crammed with Honda 50s and lined with shops selling rice and Marlboros. Then suddenly there is sea, muddy at first, then a cheerful turquoise. The propellers change pitch. The nose drops. A green mountain flicks past the wing, then a white beach. We bank steeply, lining up with a runway on which two people seem to be riding bicycles. And down slams the plane on the pockmarked concrete of Duong Dong airport, gateway to the Vietnamese island of Phu Quoc. Outside the terminal a little group of drivers are whisking red dust off Japanese four-wheel-drive taxis. In Duong Dong high street, our driver carefully skirts a cow and calf, who regard us with soulful Jersey eyes. "Manchester United," says the driver, using the universal language of south-east Asia. He grins. His English gives out. So does the tarmac. Towing a lofty plume of red dust, we pass a memorial bearing a star and the likeness of Uncle Ho, and jounce into the interior. Phu Quoc is the biggest island in Vietnam. It sits in the Gulf of Thailand, minding its own business. Until recently, this consisted of the manufacture of a world-beating nuoc mam fish sauce, the cultivation of black and white pepper, and the maintenance of a nature reserve occupying most of the northern part of the island. The fish sauce is so pungent that Vietnamese Airlines is reputed to have installed special sniffers to prevent passengers taking it in their luggage and endangering the purity of the baggage hold; the pepper is undeniably delicious, growing in palm-shaded vineyards in the sandy interior. During the Vietnam War, a camp on its east coast held 40,000 North Vietnamese prisoners, but little trace now remains. As Ho Chi Minh's tanks drove into Saigon and Americans scrambled into choppers on the Embassy roof, the population of Phu Quoc got on with its farming and fishing. The island's northern extremity lies less than 10 miles from Cambodia, and in 1975 it was briefly invaded by the Khmer Rouge. Soon after the Khmer Rouge had been chased away, backpackers started to arrive. A few hoteliers followed. The four turboprop flights a week became four 64-seater turboprop flights a day. And there they seem to have stuck, for the moment. "We are roughly where Phuket was 25 years ago," said one of the co-proprietors of the Mango Bay Resort, leaning back in his armchair as the sun plunged into the sea. Phu Quoc now has many hotels, mostly of the beach-bungalow type. Most are concentrated on Long Beach, a 12-mile strip of white sand running south from Duong Dong. Those closest to the town back onto a dusty dual carriageway studded with melancholy hawkers' stalls selling cans of green tea and the aptly-named Harpoon Gin. A safer distance down the beach is La Veranda, an elegant air-conditioned establishment with a swimming pool, cooled towels and sorbets delivered to sunloungers at noon. La Veranda is the poshest spot on the island and appeals to colonial nostalgics with deep pockets. A charming hotel at the opposite extreme is the Bo Resort, on Ong Lang beach well to the north of Duong Dong. Bo is a group of cottages dotted around a beautiful garden on a headland with splendid views over wild sea and empty shore, and knock-down prices. Somewhere between la Veranda and Bo in both style and location lies Mango Bay. This is an eco-friendly straggle of elegant cottages with verandas, sprawled along three quarters of a mile of wooded coast. More than half the Mango Bay's guests do not leave the resort, and as you lie in the warm, glass-clear water watching a squid boat on the horizon, it is easy to see their point. The restaurant is simple and excellent, the cocktails cheap and powerful, the massages deeply relaxing. One of the three owners has started a butterfly breeding programme and a propagation scheme for endangered orchids that grow wild in Phu Quoc's jungly interior. The cottages are not air-conditioned, but they are made cool and airy by the sea breeze. We lay in the gauzy cloud of our mosquito-netted four-poster, breeze wafting in at the linen-curtained windows of the hardwood bungalow, watching a fat lizard patrolling the bamboo ceiling for stray mosquitoes. The only sounds were the brush of waves on the beach, the distant thud of a fishing boat engine and the hoot of an animal in the far wooded distance. It might have been one of Phu Quoc's resident gibbons. Whatever it was, it was calling us forth to look at the world beyond Mango Bay. There are rumours (unsubstantiated by recent sightings) that Phu Quoc is one of the few places in the world where dugongs still live. I asked the French hotel manager. "Dugong? Non," he said. "They keep very much to the deep forests of the nature reserve." Suppressing a well-founded suspicion that the dugong is a marine mammal, I asked how we could visit the nature reserve. "You cannot," said the Frenchman, with powerful Gallic finality. "It is for nature, not people." This was a good point, and unanswerable. So we rented a Honda 50 from one of the Mango Bay's gardeners and set off into a land without tourists. Red dust rose behind us. Peppercorns wafted spice from the roadside, where they lay drying on blue tarpaulins watched over by Buddhist shrines. The road narrowed to a five-foot path. It wound behind the beach, threaded fishing villages studded with reeking piles of anchovies, crossed causeways through mangrove swamps, passed mile after mile of empty beaches. Farmers had limed their mango orchards with shell-sand. Fish pens the size of kitchen gardens lined the sides of creeks. A watchtower stood in the forest, flying the red flag of the People's Republic, the guard keeping an eye on things from a hammock strategically slung in the gun emplacement. We paused to let two wild bulls fight it out in the middle of the road. A feathery-trousered eagle sailed out of the clouds on the mountains and sat gigantic in a tree, regarding us with a fierce yellow eye. In the early afternoon we arrived at Cape Ganh Dhau, the island's northwesternmost corner. Howling and clanging emanated from a rickety building overhanging the beach. This turned out to be the proprietor of the local restaurant, a noted poet and electric guitarist. He laid down his guitar to show us to a table on the shaky terrace. Five miles across the sea, the first islands of Cambodia loomed out of their thundercloud. This is smuggling country. Some of the islands in these seas are no-go areas, full of drugs and guns, gangsters and brothels. Another is one of at least six islands on which Captain Kidd is said to have buried his treasure. Lunch arrived. This consisted of a saucepan of boiling broth on its own gas stove, and slabs of raw fish to cook in it. After a mighty repast of squid and sea snails I waddled onto the beach. Small boys were walking past, eating white berries off sprigs of greenery. A polite child gave me a handful to try; they tasted a little like myrtle. At this point the restaurateur picked up his radio mike and launched into a poem for the benefit of our five fellow lunchers. They clapped politely when he had finished. "What was that?" I said to the slightly bilingual waitress. "Hymn to Sea Insect," said the girl, watching apprehensively as her boss headed for his guitar. We drove back to Mango Bay and soaked off the road dust in the warm sea, watching a remora trying to attach itself to a bather until it was time for cocktails at sunset. It had been a day fraught with interest. Naturally, there are plans to make Phu Quoc even more interesting by bringing in mass tourism. A government minister appeared recently and inaugurated the building of a new international airport capable of accommodating full-sized airliners. Completion is promised for 2012. "Which means 2015," said an Australian in the bar. "If at all." Before the world financial system caught flu, tourism entrepreneurs had parcelled up the island into lots and erected billboards showing vast developments with canals, marinas and thousands of villas. These schemes are now in abeyance, but they may return. 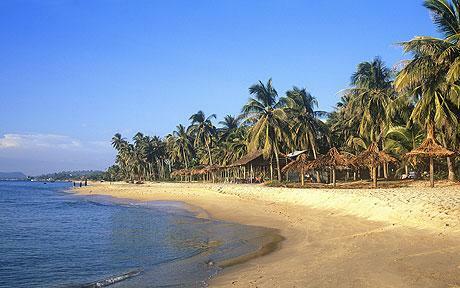 Phu Quoc is one of the world's great islands. Go now, while the going is good. Between October and April. May and June can be ferociously hot. In July, August and September there is a slim chance of good weather (and a high chance of cut rates in hotels) – but torrential rains turn the roads to red slime and the sea to soup. Vietnam Airlines flies from Ho Chi Minh City and Rach Gia; then get the fare from Ho Chi Minh to Phu Quoc. It is wise to get return tickets, as the small number of daily flights makes it possible to get stuck on the island. Singapore Airlines offers London to Ho Chi Minh return inc tax from March 3 to April 3. Less frequent ferries are also available from Rach Gia (six hours, daily) and Ha Tien (four hours, every other day). Both these mainland ports can be problematic of access.